Susanna Annesley was born January 20, 1669 in London. She was the daughter of Samuel Annesley, a prominent dissenting pastor nominated by Oliver Cromwell to serve as lecturer at St. Paul’s. He lost favor after the Restoration and passage of the Act of Uniformity in 1662. She was the 25th of 25 children in her family. At the age of 13, Susanna left her father’s church for the Anglican Church. It was around this time that she first met Samuel Wesley. Six years later, they married as Samuel completed college and was named rector at Epworth. They had 19 children, 10 that survived to adulthood. They were poor. Samuel was twice jailed for debts. They did not always agree. He left their home for months in protest of one of their disagreements. They had difficult times with two fires at their home, the second completely destroying everything they owned. The children were farmed out to family and friends for months as a new home was built. Susannah was known as an educator, teaching her three sons and seven daughters. The Epworth Old Rectory has a booklet Educating the Family extracted from a letter Susannah had written her son John. In order to form the minds of children, the first thing to be done is to conquer their will, and bring them to an obedient temper. To inform the understanding is a work of time, and must with children proceed by slow degrees, as they are able to bear it; but the subjecting the will is a thing that must be done at once – and the sooner, the better. The way of teaching was this. The day before a child began to learn, the house was set in order, everyone’s work appointed them and a charge given that none could come into the room from 9 til 12, or from 2 til 5; which you know, were the school hours. One day was allowed the child to learn its letters, and each of them did in that time know all its letters, great and small, except Molly and Nancy, who were a day and a half before they knew them perfectly. When Samuel died, the family moved from the Epworth Rectory and the building’s contents were sold to cover debts. Susanna left to live with her children, eventually moving to London to live with John at the Foundery and eventually his home at Wesley Chapel. She died July 23, 1742 and was buried at Bunhill Fields across the street from Wesley Chapel. Samuel Wesley was born December 17, 1662. He was the son of the dissenting pastor John Wesley, rector of Winterborne Whitechurch, Dorset. His mother was the daughter of John White, rector of Trinity Church, Dorchester. John Wesley was imprisoned for not using the Church of England’s Book of Common Prayer, imprisoned again and ejected in 1662. He died at the age of 42. Samuel was being educated as a dissenter. But he had a change of view and enrolled as an Anglican at Exeter College in Oxford. He served wealthy students to pay his way through school. In 1688, he completed his degree at Exeter and married Susanna Annesley. They moved to Epworth when he was named as rector there in 1697. He was a supporter of royalty, an unpopular stand in Epworth. The marshy area had been ordered drained years earlier by the king. A portion of the newly created lands went to the king, another portion to the men who drained the land and finally a portion to those who lived there. This change in land ownership angered the locals and they did not look kindly on supporters of the king. This led to fires being set to the rectory and damage to its fields and livestock. Wesley stayed in debt especially after fire destroyed the rectory and he built a new home in its place. All for the sake of a third pounds debt. His creditor seemed set on punishing Wesley and would not give Samuel 24 hours to find the money. The unsuspecting Samuel came out of church after christening a baby and was arrested in his own churchyard. News filtered through Epworth. Far from taking pity on Susanna, the villagers proceeded in the rector’s absence to wreak havoc on his farming endeavors. Samuel remained imprisoned for five months. The Wesleys had three sons and seven daughters who lived into adulthood. The sons all graduated from universities at Oxford. Samuel held his parish and family to strict standards. His public condemnation of church members contributed to the ill treatment of the family. He was at odds with his wife and left Epworth in protest for months. When his daughter Hetty ran away and returned home unmarried and pregnant, he was unforgiving. When John preached sermons in Epworth on the subject of mercy, Samuel did not mend his relationship with Hetty and took issue with the criticism. Samuel was an author. He published articles that helped him pay his way through university. His life’s work was a study of the Book of Job written in Latin. His son John completed and published the work after Samuel’s death on April 5, 1735 He was buried at St. Andrews Anglican Church in Epworth. 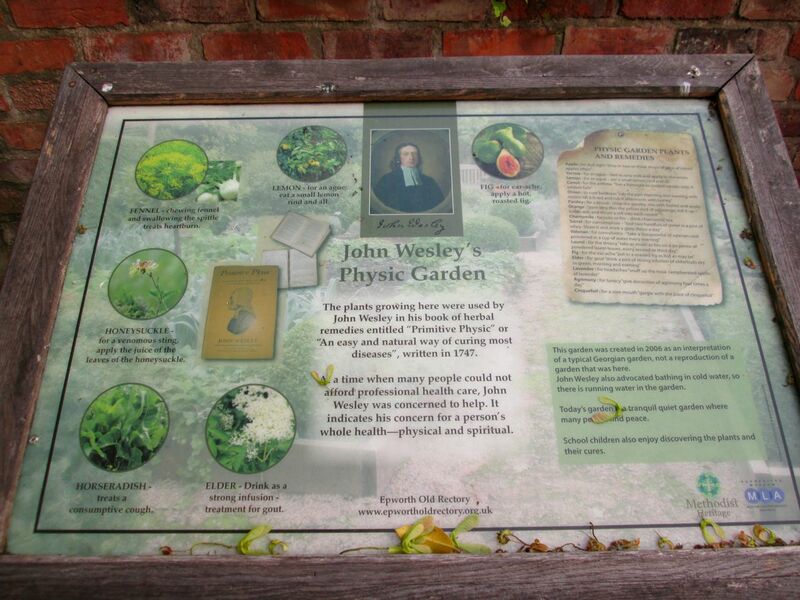 Behind the Old Rectory in Epworth, UK, you will find John Wesley’s Physic Garden. It opened in July 2006 and was created to celebrate the contribution made by Wesley to the well-being of the poor who were unable to pay for a physician. He wrote An Easy and Natural Way of Curing Most Diseases in 1747. The garden is an interpretation of a typical Georgian garden and not a reproduction of what was at the site. We placed photos from our visit on the JohnWesleyBlog flickr page. You can find Wesley’s booklet also known as Primitive Physic here. 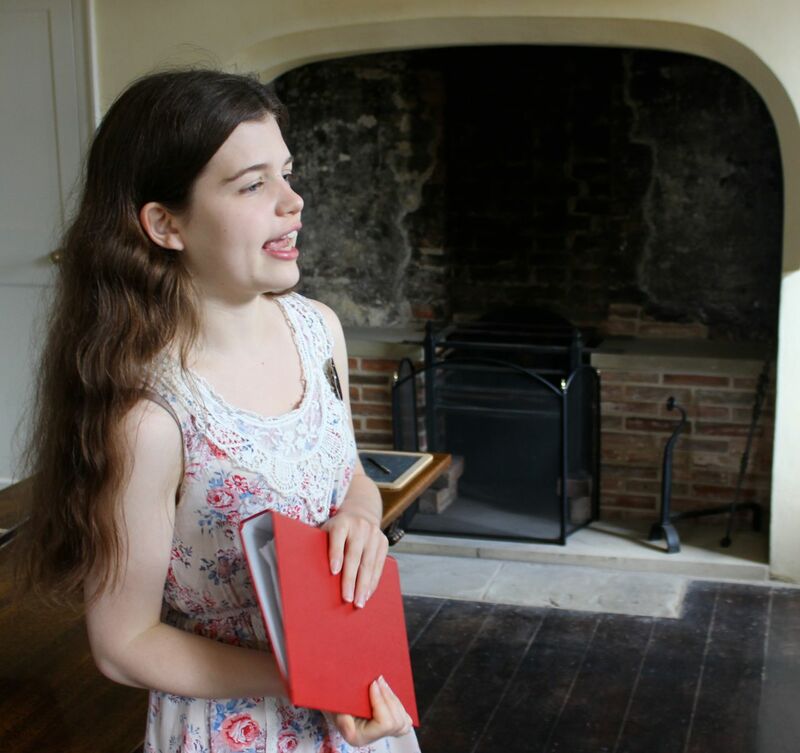 We had a great tour at the Old Rectory in Epworth, UK, thanks to our guide through the Wesely house, Amy. She shared details of the Wesley family and important information discovered in the restoration of the house. Afterwards, she talked with me about the seven Wesley sisters. A book written about the Wesley women is Seven Sisters in Search of Love by Frederick Maser.